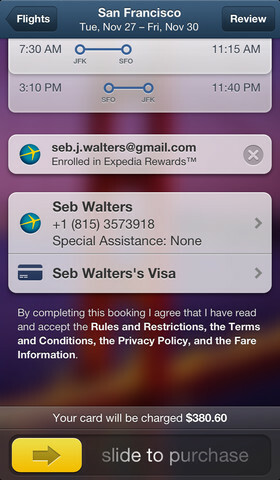 The Expedia Hotels & Flights app received a minor update the other day to allow flight booking in Canada. The app brings some exclusive hotel deals and if you’re already signed in you can book a flight in ‘under 30 seconds’ according to Expedia. The final check page has a clever ‘slide to purchase’ which is a take on the iPhone lockscreen’s ‘slide to unlock’. Slide to purchase and away you go! 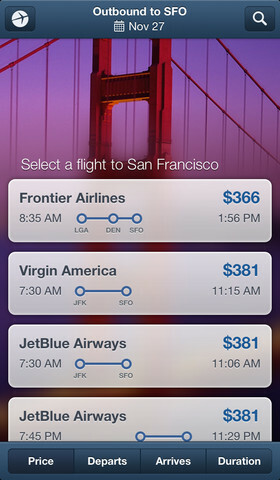 Click here to download the Expedia iPhone app–it’s free. 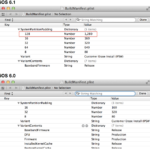 Next iPhone / iPad Refresh To Introduce 128GB Models?